Between email accounts, retail sites, and online banking, we acquire a lot of passwords these days. It's hard to remember them all. And the most obvious solutions aren't always the best ones. Using the same password for everything isn't safe. Nor is keeping them in a text file on your hard drive. Today's browsers have their own built-in password storage, but that isn't all that secure, either. That's why I'm a huge fan of Password Safe, yet another excellent, free, open-source program. It keeps your passwords in an encrypted file. You can organize them into categories (mine include Business, Entertainment, and Financial). 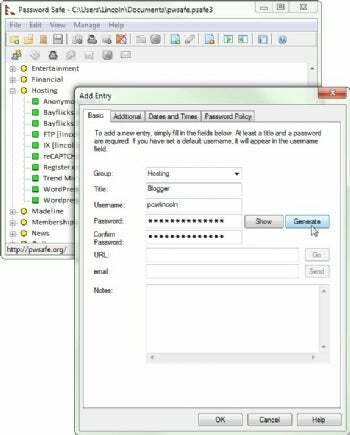 And the program can copy a password to the clipboard with a double-click, or insert it into the appropriate Web page with a menu option. It can even generate random passwords--the hardest kind to crack. But you can't be completely forgetful. If you don't remember your Password Safe password, you'll lose all of the others. That's my recommendation. You'll find others at the original forum discussion.